The Whirlwind E BEAM incorporates the latest laser technology resulting in the first truly affordable solution for reliable Ethernet and CobraNet© wireless transmission. 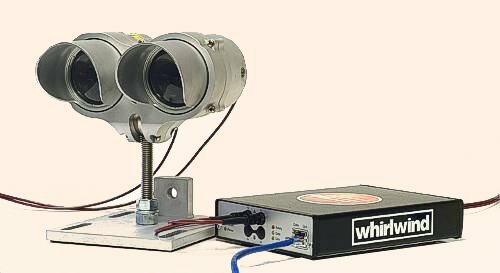 The Whirlwind E BEAM is a system for transporting Ethernet or CobraNet data, either point-to-point or cascaded, over a modulated Class One IR laser beam. It represents the latest breakthrough technology in wireless digital laser transmission. The E BEAM transmits Ethernet or CobraNet. These protocols have rapidly emerged as the standards for digital audio, digital video and control transmissions such as CobraNet, MPEG, AMX, DMX, RS232, etc. The 100Mb full duplex bandwidth has the capacity for transmitting and receiving large amounts of data or 128 of channels of CobraNet audio in real time. Following soon will be a 1Gb version which will increase capacity ten-fold. Switching between 100Mbs and 1Gbs only requires changing the media converter, the antenna supports both versions. E BEAM units can be setup quickly - you're up and running in minutes. Easily set up and aimed over distances up to 900 ft., just point and shoot. The E BEAM can solve many of the logistical problems encountered when using standard copper wire or fiber optic cabling. It's a great solution for "on the spot" setup where there's breaking news, at music festivals, over highways, building to building, anywhere a laser beam can travel and cable cannot. You can route the beam vertically up building cores or horizontally below a ceiling. Link up offices, campuses, stages and sporting events without trenching cable or installing conduit. Connect buildings with VOIP systems to reduce line access costs. Share computer network resources throughout an office complex or building-to-building on campus when obstacles prevent hardwired solutions.